This month we are Mad About Design. I hope all of you are as excited as we are for the return of one of our favorite shows on April 5th, Mad Men! And sad at the same time as that means there are only 7 episodes left before the series if finished. That being said this month we are celebrating that Mad Men Style. We will be featuring our favorite Mid-Century Modern design, tips, and tricks and sharing ways you can steal that Mad Men look for your own space. Mid-Century Floor Lamp with Side Table from 1stdibs – This lamp features solid walnut details and a three way switch. 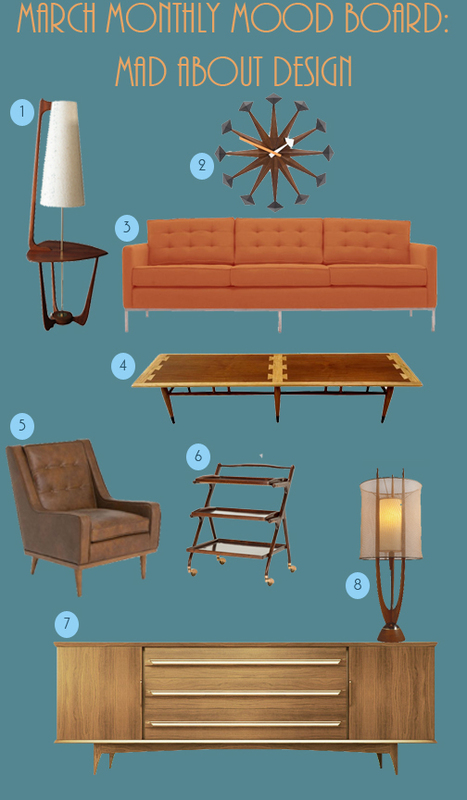 This is a great way to add a side table and a lamp to a small space and still have the mid-century modern look. Polygon clock, George Nelson from Vitra – We love anything and everything that has that starburst effect to it, which is why we love this clock. The wood finish coordinates with other pieces in the space and we love the pop of orange on the hand of the clock. Franklin Sofa from Joybird – We love the metal base and tufted back cushions of the Franklin sofa and chose to upholster it in a great vintage orange color very much like a sofa we have so often seen so many times in the Mad Men offices. Surf Board Coffee Table by Lane – We love the dovetail details in the top of this coffee table and the two toned oak/walnut veneer. This is the perfect addition to a mid-century modern living room or office lounge area. This particular one is the rare, extra-long size that has the additional dovetail details in the center of the table. Kistler Chair from Anthropologie – The mid-century modern lines of this tufted back leather chair work great with the sofa we chose and add a masculine vibe to the space. Italian Mahogany Serving Trolley/Bar Cart by Italia designer Cesare Lacca – No mid-century modern space is complete without a great bar cart. This three tiered cart is perfect for entertaining and has just enough space for all the vintage cocktails you may want to shake (or stir) up. Matthers Credenza from Thrive Home Furnishings – The perfect example of a 1950’s credenza, this piece is perfect to hide away items you do not want in view. It is a sturdy, functional piece that could work in a living room, dining room, or home office. Danish Lamp – No console is complete without a great lamp (or pair of lamps) to top it off. We love this towering Danish lamp with walnut brackets extending upward from the brass base. The double shade adds more interest to the lamp and makes this the perfect addition to add some light to our mid-century modern space. « Travel is Inspiration: Where do you want to travel?